Back in August, I came across this strange building on Steuben. All that blue is a bunch of words made with tape (props for creativity and resourcefulness). It's called Brooklyn's Other Museum of Brooklyn. The website lists this house as the museum's headquarters, so it sent me on a bit of a wild goose chase. Spent any time in northern Clinton Hill/Wallabout? Then you may have seen a plethora of political rants spelled out in blue painter's tape at various locales. 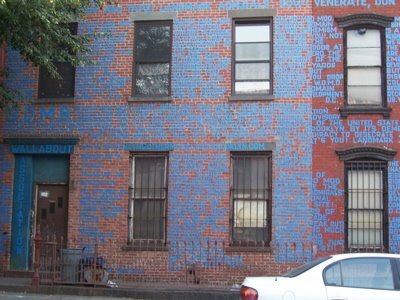 Beginning with a small section of the brick wall in front of the Navy Yard's Admiral's Row, the taped words now cover two entire townhouses on Steuben Street, admonishing the Mayor and government. The building is labeled "Brooklyn's Other Museum of Brooklyn," and the rants focus on promoting preservation of Admiral’s Row. Inside, a rickety set of stairs leads to owner Scott Witter, who waits in a chilly second-floor space for visitors. An ancient bomb hangs overhead not far from the second floor museum entrance, and the sight of it finally makes sense of the museum’s name – B.O.M.B. As it turns out, B.O.M.B. is dedicated to Witter’s efforts and publicity in preserving Admiral’s Row. The space is filled to the brim with binders full of copied letters written to local and national politicians (No, Laura Bush did not write back), photos and documents. Beautiful renderings of homes on Admiral row from their glory days line the walls in the back room, as does an impressive illustration of the olden days at Wallabout Market. Witter is a man passionate about his surroundings. He even did a day of jail time for his original protest graffiti, in the old-school medium of spray paint. Having spent the last 40 years of his life as a Clinton Hill resident, Witter is a true historian. Need information on what’s gone on here in the last several years? He’s your man. He’s also on a committee that aims to turn Wallabout into a historic landmarked district. One of the most fascinating aspects of his collection is his archive of The Hill, a local quarterly paper that I can never seem to find aside from the waiting room of the Brooklyn Veterinary Hospital. Scattered across a pool table at B.O.M.B. are several issues from the 1980s, many of them detailing the same issues Clinton Hill faces today. Oddly enough, there’s not a single item in the “museum” from the Brooklyn Navy Yard or Admiral’s Row. One would hope that Witter had obtained some intriguing artifacts to promote his cause, but instead the museum is more of a collection of “old stuff” – a cluttered table full of statues, ashtrays and broken china, broken chairs, mannequins and the like. Witter owns several buildings in the area, including 111 Hall Street (a white house with strange windows), which is listed incorrectly as the museum’s headquarters on its website. Turns out he plans to keep the museum moving around while he renovates his properties. Seems like he’s good at keeping people on their toes.